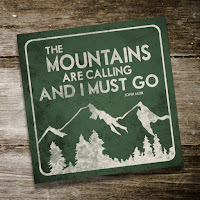 URBAN VAGABONDS: THE CALL OF THE MOUNTAINS. THE CALL OF THE MOUNTAINS. I would like to believe that I have earned my sudden craving to get back to the mountains and feeI that I definitely need to head back for one more Himalayan Trek in 2015. I am sure a number of us have over time decided to ‘explore the world ‘ and want to get back to travelling ,backpacking or even trekking, activities that for one reason or another take a back burner. Sadly, we usually have real world responsibilities; kids routines, husbands travel plans, budgets etc,that prevent us from being free to take that trip , but for those times there is always armchair travel . In my case it is this arm chair travel that has pushed me to list my definite to do 3 treks and I and look forward to heading for any one this autumn. Pick your immediate big adventure from this list . I think it’s all about taking that first footstep and finding your level. British mountaineer Frank Smythe stumbled upon the Valley of Flowers in 1931. ‘In all my mountain wandering,’ he wrote, ‘I have not seen a more beautiful valley where the human spirit may find repose'. I definitely look forward to witnessing this world heritage site framed by the mighty 6000m mountains that have glaciers and snow decorating their peaks all through the year. I will be at this gorgeous camp on the 1st September and have chosen to travel with GIO Adventures.I believe that almost 300 species of wild flowers bloom here unhindered by mankind. The prominent species are Brahmakamal, Blue Poppy, Cobra Lily Anemone, Geranium, Marsh Marigold & Prinula. Beyond the valley is the Sri Hemkunt Sahib Gurudwara , a popular centre of Sikh Pilgrimage which is visited by thousands of devotees from all over the world every summer. I am aware that the route to Hemkund Sahib (4329 meters, 15210 feet) is all the way uphill, and entire 6km of it but I have decided to include that in my trek and look forward to exposing my pious side. 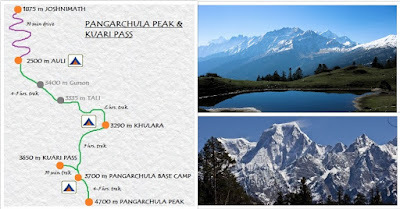 Kuari which means “doorway” is a Himalayan high mountain pass apt for beginners and early trekkers. Situated in the Garhwal region of northern India, south of the Tibetan border ,the Kuari Pass Trek found fame in the early 1900’s when intrepid adventurers and mountaineers such as Lord Curzon, Eric Shipton and Bill Tilman used the passage in their pioneering explorations of the region. 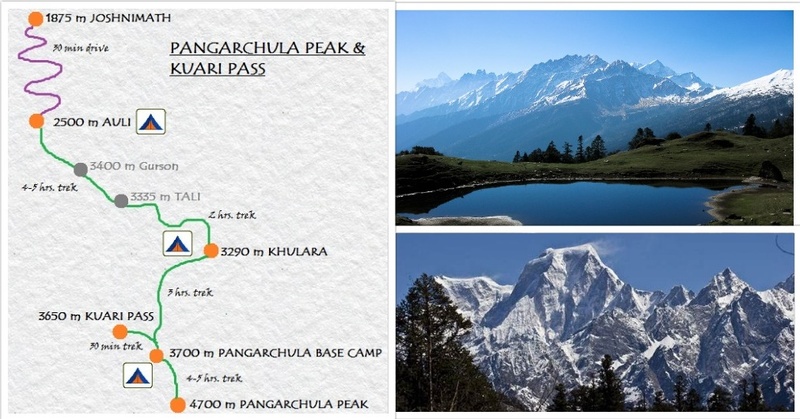 The Kuari Pass trek is known as The Curzon Trail (named after the former British Viceroy Of India “Lord Curzon”). The expedition starts from Auli, which is famous for its ski slopes and for its excellent views of Nanda Devi peak. The approach to the 1st base camp at Khulara is through dense forests, meadows and a small summit called the Gorson top. Throughout the expedition trekkers get glorious Himalayan views of some of the prominent peaks. 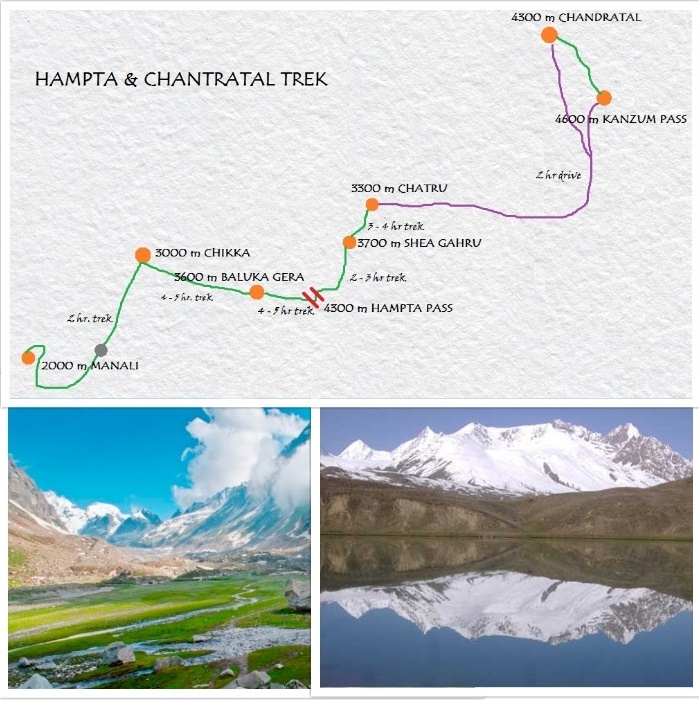 The basic Hampta pass trek starts from Hampta village in the Kullu valley and finishes at Chatru in the Lahaul & Spiti valley. The Hampta pass trek is an ideal trek for anybody planning their first high altitude trek. This trek takes you through varied landscapes from thick deodar forests in the beginning, through snow clad valleys and finally through the unique barren landscape of Lahaul and Spiti. An added drive + trek to Chandratal is like stepping in heaven. Chandra Taal (meaning the Lake of the Moon) situated at an altitude of about 4,300 metres (14,100 ft) in the Himalayas got its name because of its crescent shape. It is believed, Chandratal was discovered by traders who came to the region from Tibet or Ladakh. The day climb to Kanzum pass located at 4600 meters and the return drive from this trek over the Rothang pass are added bonuses. The distances in the Himalayas are deceptive, the snow peaks look nearer than they actually are but it’s that long way round that allows you to experience the beautiful vistas. 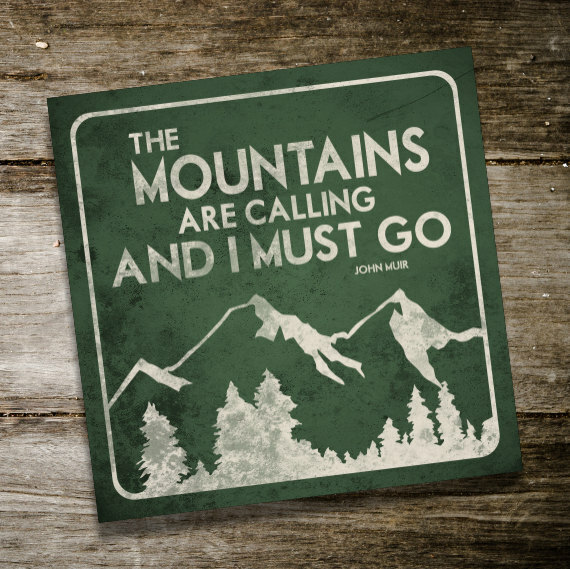 So keep your rucksack light and get to the mountains.